1. In my mind, yurt = round tent, and tent = camping, which we do a lot of! But, it has to be more than that, right? You LIVE in one, even in the winter, which means you have heat, and it hast to stay warm and dry, and not blow over in the wind. How would YOU describe a yurt to someone? I usually say if a house and a tent got together and had a baby they would have a yurt. It’s old technology, originating from animal herders in Mongolia who needed homes that were both portable and very warm. Picture a latticework frame of crisscrossing sticks. Then stand that up and walk the ends together so it makes a circle. Wrap it around with a sturdy tension band, set a “crown” overhead with stick rafters, and dress the whole thing with as many layers of soft goods as appropriate. The Mongol herders would have used blankets of felted animal hair, but ours is heat-sealed canvas and double bubble insulation, with a pretty fabric interior. It isn’t town living, but it’s not very much like camping, either. Our yurt feels quite posh in the sense that we have real furniture: comfy chairs and real beds. But the walls are still soft. There’s no real sound barrier to the outside, and we open and close our canvas and plastic windows with a zipper. Also we have no water lines to or from the inside of the yurt. 2. Amenities. I understand yurt life is off-grid, but never having experienced this round-tent life, I wonder… do you have a kitchen, or do you cook and wash outdoors? How does one heat and light a yurt? Is there an indoor composting toilet, or do you walk to an outhouse? My kitchen is half inside and half outside. I go through the yurt door all day long. Back and forth, back and forth. I wash dishes in plastic tubs indoors, where the air temperature is comfortable and I have plenty of room to stack the dishes, but I get the water from my sink outside. I chop and measure and mix indoors, where my food is stored, but I cook and bake and can outside, on the wood fired stove or the propane burner. In the winter I do as much as I can right on the top of our heating stove, indoors. It’s perfect for coffee, popcorn and toast, which pretty much covers all our favorite comfort foods. We heat with wood, much like anyone who heats with wood, except that our little pot bellied stove is pretty small because we are heating a small space. We have an exhaust going right out the side of the yurt to draw the smoke, and a tile hearth to protect our fabric walls from the heat. We rely heavily on natural lighting, through two windows, a glass door, and an opening in the top, or “crown,” which we cover with a canvas flap when weather requires. A nice thing about a round space is that it really does conserve light as well as heat. There are no dark corners. And of course we more often go to bed with the sun than you might think. We’re just now setting up solar panels, but so far we’ve cobbled together various solutions for lighting after the sun has gone down. We have a candle chandelier and a battery powered camp lantern, and the kids wear headlamps to read in their beds at night. I don’t like using all those batteries, but we haven’t been able to make do without them. For the bathroom, we walk to an outhouse. If we had known our “temporary housing” was going to be three year housing, we might have done the work to set up a more convenient solution! Getting outside to the outhouse in the wintertime really is a bummer. I don’t mind it so much personally, but my six-year-old daughter thinks it is the absolute worst, and I can see her point. 3. 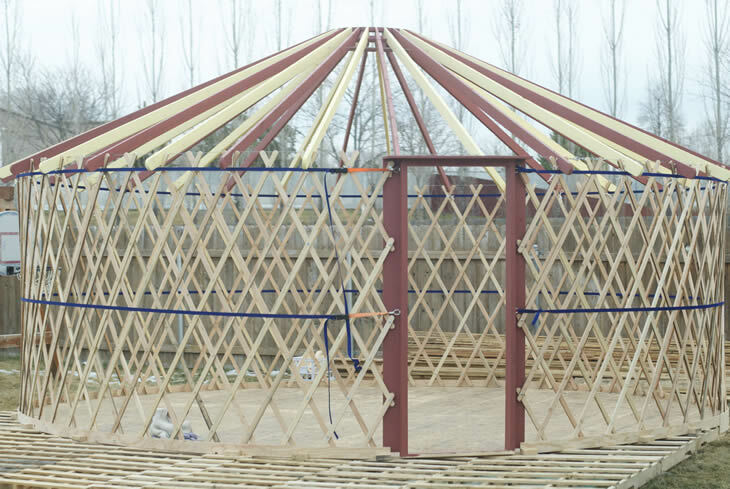 How does the interior structure of a yurt differ from that of a house? Is it void of walls and separators, or do you have curtains to divide rooms? Does one decorate a yurt by putting things on the walls? I’ve seen a photo of the outside of your yurt and you have a deck/porch. I am guessing the whole yurt sits on this so you have a floor inside vs dirt floors? It’s our style to have a very open floor plan. The peaceful feeling you get living in a round room feels kind of lost if you divide the spaces very much. With that said we do have a four-poster bed and can close a curtain around the bed, and the kids occasionally hang blankets to do the same around their own sleeping spaces. There is a play nook and a reading nook, and as a family we have learned how to feel separate from each other even while technically all in the same room. About decorating a yurt, that’s actually very fun. The latticework frame makes a crisscross pattern everywhere, even over the windows, so we are constantly just tucking things between the frame and the fabric, from quilts to flowers to artwork of all kinds. It’s also very easy to put up nails to hang pots and potholders, baskets, etc. In our case most of our decorating is simultaneously functional. That’s because we’re in such a small space and it’s also just our style. The walls themselves are a decoration of sorts, because the interior is made of thrift store flat sheets in muted patterns. They look sort of like a fabric wallpaper. And yes, we do have a finished floor. Before we set up the yurt, we set cement blocks in the dirt, then pallets over that, then a plywood floor over that. But eventually we added a laminate floor even on top of that, so that’s actually very posh. It took a long time to cut all those curves! 4. Why the yurt? People often choose some form of in-between housing while they save, or wait, to build a house. Some use large square tents, or campers, others choose yurts. I’d love to hear why your family chose the yurt, and some of the pros and cons of going that route! Also, is it sustainable, or only recommended as a temporary house? Absolutely the yurt is sustainable! If it were only my husband and myself we might stay in the yurt forever, repairing the deck if and when it started to get crumbly. But we have three kids and they’re literally growing out of their beds. Maybe we’ll get to move back into the yurt when we’re empty nesters. I can dream, anyway. As to why the yurt, when choosing a living situation for our off grid escape property, we knew we wanted something Nick could build himself. And we were particularly attracted to the idea of something Nick could build off site and carry in, since we knew there would be few tools and limited power on site. We ended up making the yurt in Nick’s brother’s garage, in about a month and for about 1500 dollars, then carrying it to the site in one pickup truck load and setting it up on our property in three days. The cost of our home has risen well past that since then, as we added nicer flooring, a solar powered fan, more insulation, etc. But it was the quickest, cheapest way for us to make the leap from bare land to happy living. I don’t have many bad things to say about a yurt, honestly. Steps do have to be taken, though, to deal with heat and wind. It’s easier to heat a yurt than to cool it. We installed a solar powered attic fan and strategic house plants, and even with that summer afternoons are still a good time to be anywhere else. Also, our wood lattice-and-rafter frame is well secured with tension bands to keep us sturdy when the wind blows. I’ve heard of yurt-dwelling folk feeling quite insecure in their stick and fabric houses. That wall strength (and ability to hold snow load) is all about the tension bands. 5. I know you are excited about finally building your dream cabin! What will become of the yurt you’ve called home these past few years? Our yurt isn’t going anywhere. I’ve been building some of our permaculture style “food forest” right around the yurt, so it will continue to be a part of our life and lifestyle. We’re even going to leave the double bed and kitchen counter set up, in hopes that our friends and family will come to stay a weekend now and then. Also, my oldest child says he plans to move back into the yurt when he’s a grown up. But he’s only seven right now, so we’re taking that decision pretty lightly. 6. And finally… I had the pleasure of meeting your mother and hearing her speak when I was about fourteen. Carla was as down to earth as anyone I’ve met. You have shared that in your younger years you didn’t subscribe to her way of life, but like any parent, she loved you quietly and hoped that someday you’d awaken to wisdom and appreciate nature. :) What do you think her reaction would be to your chosen lifestyle and the yurt-home? My mom was always incredibly proud of her kids. There are seven of us, and we’re doing wildly different things, but we have in common a healthy resistance to group-think and a lot of courage to live according to our deepest values. There’s a funny challenge, which I meet in my own parenting as well; if you really want to teach your children to think for themselves, you have to tolerate the point at which they disregard your own example. To my mom, it was always more important that her children could research, analyze, argue and defend a course of action than it was that we follow in her footsteps. The way I have entered into my mother’s legacy is really just proof of the urgency and continuity of the issues she addressed. Especially the lack of sustainability and health risks posed by our broken food system. My mother gave me a fully formed mind and eyes to see, and so it happened that I came to see the same world she was looking at. I do think mom would enjoy talking to me now, because we have so much of the same information, but I’m not sure she could be any more proud than she already was, of me and each one of her children. For those of you who don’t know her already, Esther is the daughter of Carla Emery, famed author of The Encyclopedia of Country Living. Esther and her family live off-grid in the mountains where she writes about life, faith, nature and seasons. You can read her About page here, but my favorite get-to-know-Esther post is here: An Esther Primer for New Followers. Head on over and subscribe to her blog, and while you’re there, follow her on Facebook and YouTube! I have always wanted to live in a yurt! I totally feel you about the kids though. Now that there are soon to be five of us in our family, my days of yurt dreaming are mostly over. I don’t think we could squish us all into one space. A while ago, my husband and I marked off in a parking lot how big one of the biggest yurts would be and it was so much smaller than I realized. Thanks for the pictures and the interview. Love hearing about yurt living! Hi! We visited a dairy with 4H one year and the owners lived in yurts. Ever since I have wanted to try one out. I recently read that one of the state parks here in Arkansas (I think Petit Jean, but I could be wrong) is now offering yurt rentals instead of cabins. Can’t wait to try it out!